← So Very Refreshing. Shaved Lemon and Fennel Salad with Rocket, Currants and Almonds. A glorious, golden Roasted Carrot and Lentil Soup inspired by our recent visit to the Macedon Ranges in the Victorian countryside. This sweet, warming and very moreish soup is on the menu of Alla Wolf-Tasker’s newest venture the wonderful Wombat Hill House Cafe which is nestled in the old caretaker’s cottage in Daylesford’s Wombat Hill Botanical Gardens. Established in the 1860s, the gardens are perched on the summit of an extinct volcano and provide panoramic views over Daylesford and its surrounding districts. A stunning setting for a gorgeous cafe. This year the Age Good Food Guide awarded Alla the “Living Legend” Award. This prestigious award recognises her commitment, enthusiasm and drive for over more than twenty years as an advocate for local tourism and hospitality in the Daylesford and Macedon Ranges area. With those credentials there was no way that we were going to miss the opportunity of dining at the Wombat Hill House Cafe. So after a very brisk stroll through the gardens on an unseasonably cold Spring day we decamped into the Cafe for a long, leisurely lunch. 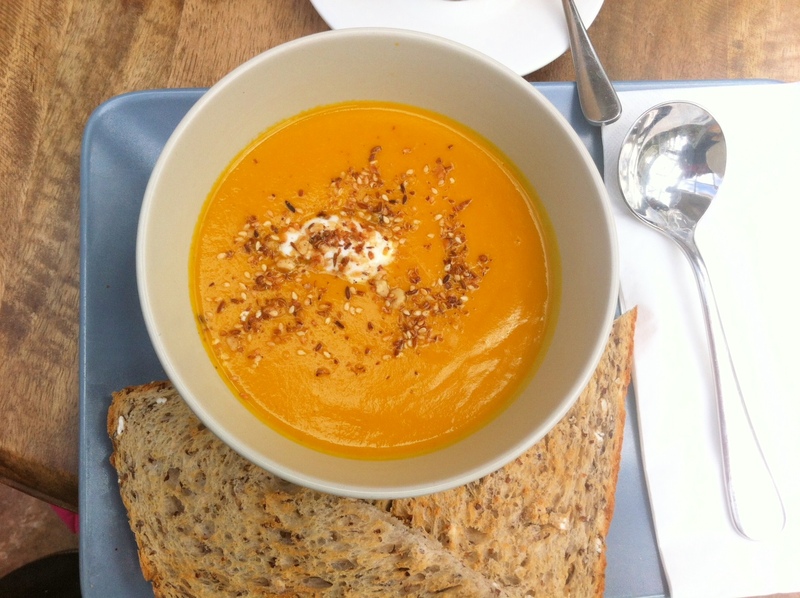 Our first selection from the menu was the wonderfully aromatic Roasted Carrot and Lentil Soup pictured above. So beautiful and full of flavour that I was inspired to recreate it at home. Probably not a patch on Alla’s but it evokes happy memories of a much-anticipated and long overdue weekend away with two of my oldest friends. 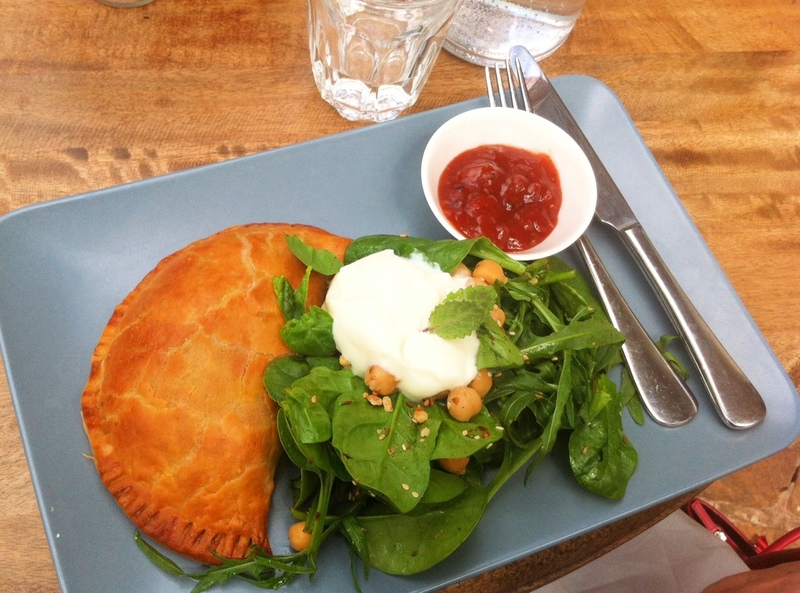 Next we sampled a Moroccan Dukkah Spiced Pasty with Kasundi Relish and a Chick Pea Salad. Absolutely delicious! 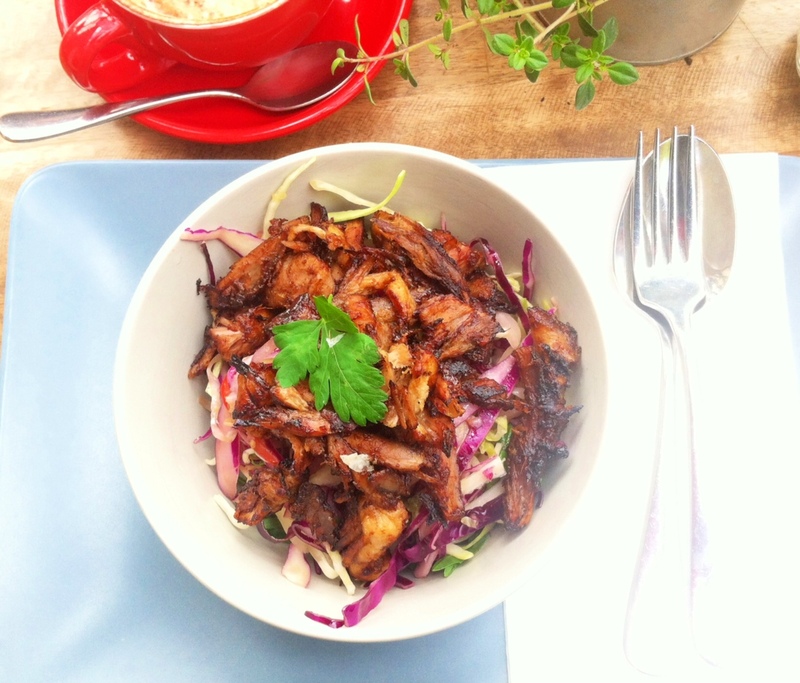 Followed by a Crispy Duck Coleslaw. And of course we couldn’t resist the sweet treats at the counter. 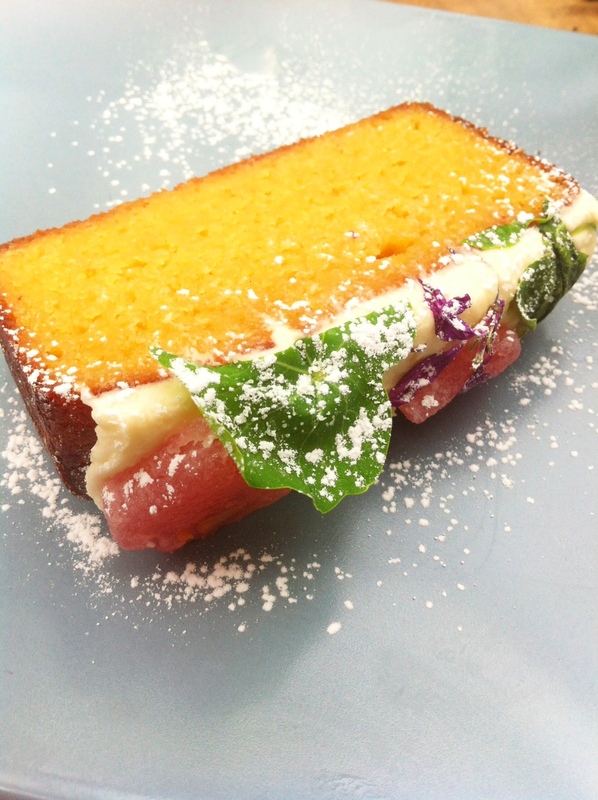 An unbelievably pretty Flourless Orange Cake with Cream Cheese Frosting, Turkish Delight and Nasturtium. 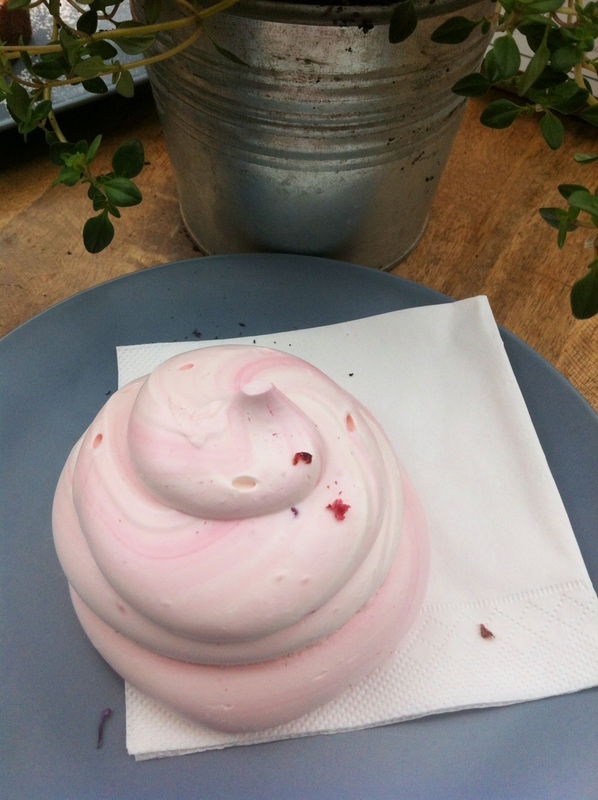 A cloud of Rose Water Meringue. 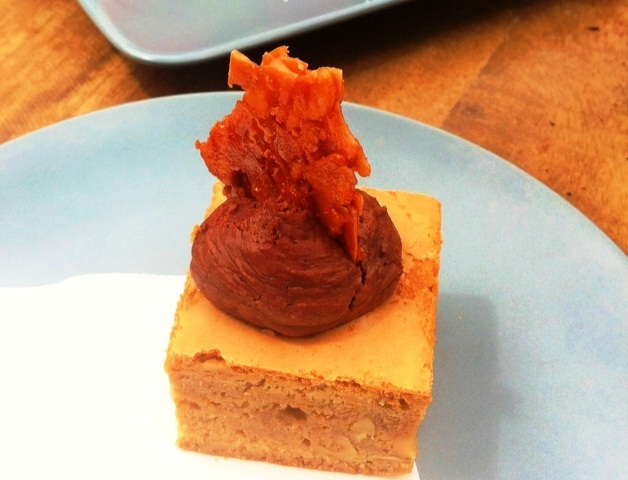 And last but not least a square of Walnut Slice with Chocolate Mousse and Almond Praline. Wombat Hill House Wombat Hill Botanic Gardens (Car Entry off Central Spring Road), Daylesford, Victoria, Australia. Back in Sydney I’ll attempt to recreate the memory of a wonderful lunch with my version of a Roasted Carrot and Lentil Soup. LINE a large roasting pan with baking paper. Place carrots in the pan, drizzle with 2 tablespoons of oil, a generous pinch or 2 of sea salt and a good grinding of pepper. Toss to coat. ROAST for 30-35 minutes or until golden and tender. MEANWHILE, heat 2 tablespoons of oil in a large saucepan over medium heat. Add onion and season with salt. Reduce heat to low. SAUTE, stirring often, for 10 minutes until translucent. ADD celery and cook for a further 5 minutes. ADD coriander, cumin and turmeric to the pan, along with the chilli and garlic, and cook for a minute or two, until fragrant. ADD the lentils and saute for about 5 minutes until they just begin to soften. ADD the roasted carrots, stock and lemon zest. Increase heat to medium. Bring to a gentle simmer and cook, covered, for 15 minutes, until the lentils are soft. REMOVE from heat and allow to cool for 10 minutes. Remove lemon zest. Purée soup using a stick or jug blender until smooth. TRANSFER pureed soup to a clean saucepan. Return to heat and cook gently for a minute or two. Dilute with a little hot water if the soup seems too thick. LADLE into warmed bowls. SERVE with a generous dollop of yoghurt and sprinkling of za’atar. This entry was posted in Soup, Vegetables, Vegetarian, What I Love to Cook, Where I Love to Eat and tagged Carrot, Chilli, Coriander, Cumin, Daylesford, Food, Garlic, Lemon, Lentil, Recipe, Soup, Turmeric. Bookmark the permalink. 2 Responses to Inspired by a Visit to Wombat Hill House Cafe. Roasted Carrot and Lentil Soup. Perfect weekend, yummy food, fabulous company! The soup looks great – on my list to try….wonder who else is looking forward to this? ?